All property owners know that clean surfaces make the visual difference between messy and tidy. It is easy to keep track of clutter inside your home but outside is different. In the same way that a cluttered table or counter looks untidy – so does your roof. Our Coquitlam roof cleaning and moss removal is available to kick clutter out. The surface of your roof is a prime area to collect debris. Depending on the style of your home or business this might be obvious or a complete surprise. In either case, our Coquitlam roof cleaning and moss removal service can be designed to suit your needs. 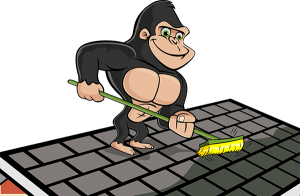 Gorilla technicians are available to clean the roof of your commercial, residential and even strata properties. All over Coquitlam, homes and businesses are facing off against the spread of moss across their properties. A thin layer of moss across the roof and walls of your property might lend a rustic look but it is no good to have around. As moss begins to spread, it retains moisture against the surface of your roof. This moisture grows and spreads under shingles, pulling them away from the decking underneath. Once shingles are gone, rain, melt and retained moisture have access to the more vulnerable parts of your roof. More often than not, decking and other materials surrounding your roof can become softer and more susceptible to damage. There are any number of ways that your roof can become cluttered, but only one sure fire way to get it clean. Yup, that’s right, our Gorilla technicians! Our Gorillas are careful, not only to remove surface clutter but to remove moss in an non-destructive way. Your home or business is one of the biggest investments that you will ever make – let us help you take care of it!